Until the newest Mac Pro started shipping in December 2013, the perennial workhorse of Apple’s professional computing line up did not have USB 3.0 ports and was, instead, saddled with USB 2.0 and FireWire 800 ports. Unfortunately, owners of older Mac Pros have not, until recently, been able to utilize USB 3.0 PCI-E cards for the lack of software drivers and the lack of internal power connections in their Mac Pros to supply those cards with enough power to power external USB 3.0 equipment such as external hard drives, flash drives, etc. 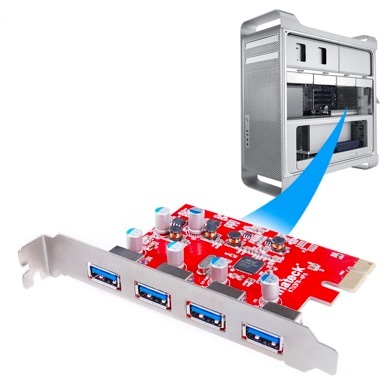 Enter the Inateck USB 3.0 PCI-E card designed especially with Apple’s Mac Pro in mind! Pros: Relatively inexpensive (at the time of this writing: $26.99). Easy to install - simply power off the Mac Pro, install the card, and restart your Mac! Does not require internal power connections in the Mac Pro in order to work. Works with built-in drivers in Mac OS X 10.8.2 “Mountain Lion” and higher. Although not tested in a Windows-powered desktop, the card came with a CD containing drivers for use with Windows XP, Windows Vista, and Windows 7. If running Windows 8, the required drivers are already built into the operating system. Cons: Although the card will function as a USB 2.0 card in Macs running Mac OS X 10.6 “Snow Leopard” and OS X 10.7 “Lion”, the user will not be able to take advantage of the speed of USB 3.0 devices as those operating systems aren’t supported. 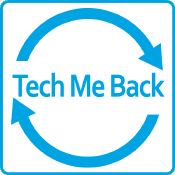 There are many Mac Pros out there that are still running an older operating system that will not be able to benefit from USB 3.0 devices as a result. As the card is mounted at the rear of the Mac Pro tower, it is quite difficult to access these ports temporarily. For long-term use, you can plug the devices in the card at the rear of the Mac Pro and leave them connected or consider using a powered USB 3.0 hub (pictured below). For temporary uses, though, you may want to consider either utilizing a USB 3.0 hub or a USB 3.0 extension cable (pictured below). Comments: I tested this card using a Newer Technology Voyager Q Quad-Interface Drive Dock for 2.5" & 3.5" SATA drives as it features a USB 3.0 port in addition to FireWire 800 ports, a FireWire 400 port and an eSATA port. I also used a 3.5” Seagate Barracuda 2TB hard drive (an energy saving hard drive that spins at 5,900 RPM instead of the higher performance 7,200 RPM hard drives) for testing purposes. Moving a disc image weighing in at 636.2 megabytes (essentially the contents of what would be stored on a burnable compact disc), I was able to copy that from the Mac’s internal hard drive, though the USB 3.0 PCI-E card to the external Seagate hard drive in 9.5 seconds. By contrast, if I used the USB 2.0 port built into the front of my Mac Pro, the same transfer took 21 seconds. More than twice as fast! Moving the same disc image to a USB 3.0 flash drive placed in the USB 3.0 card, by contrast, took 58 seconds. If the same USB 3.0 flash drive was used in the Mac Pro’s built-in USB 2.0 port, the transfer took 72 seconds. It should be noted that flash drives do not read/write data as fast as conventional hard drives or Solid State Discs (SSDs) so these slower results were to be expected. All in all, this is a worthy and very inexpensive upgrade for older Mac Pros running Mac OS X 10.8.x “Mountain Lion” or later. It will allow you to connect USB 3.0 devices to your Mac Pro without having to spend a ridiculous amount of money to do so.